1 Person Dead After Attack On Ebola Treatment Center In Congo An Ebola treatment center in the Democratic Republic of Congo has been attacked for a second time in the past month, as the country deals with one of the largest outbreaks of the epidemic in history. 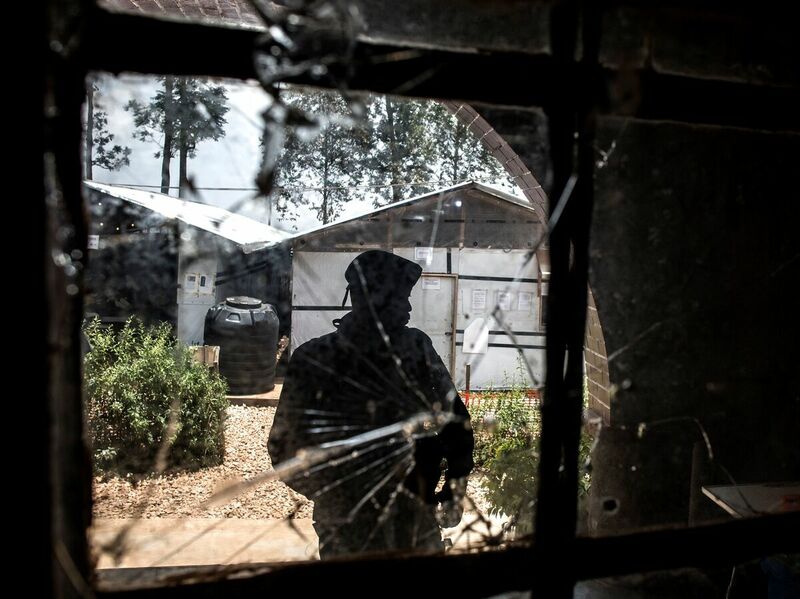 A police officer stands guard in front of a window riddled with bullet holes in an Ebola treatment center, which was attacked in the early hours of the Saturday morning in Butembo. The Democratic Republic of Congo is currently experiencing one of the largest Ebola outbreaks ever. As the Democratic Republic of Congo continues to experience a deadly Ebola outbreak, armed assailants attacked an Ebola treatment center in the eastern city of Butembo early Saturday morning. A police officer was killed, according to The Associated Press, and health workers were wounded. The violence comes less than a week after the center reopened following a previous attack last month that led the aid group Doctors Without Borders to suspend work in parts of the region. The Butembo treatment center quickly reopened, and last Sunday, Congo's Ministry of Health tweeted a photo of smiling workers giving a thumbs up. Reprise du travail avec le sourire au Centre de Traitement #Ebola de #Butembo ce week-end. This most recent attack occurred hours before the World Health Organization's director-general Tedros Adhanom Ghebreyesus planned to visit. He toured the center, which remained open, and met with the staff and local officials. "These are not attacks by the community, these are attacks on the community," Adhanom Ghebreyesus said. "We have no choice except to continue serving the people here, who are among the most vulnerable in the world." He pledged the group is committed to ending the Ebola outbreak in the Democratic Republic of Congo, and said they will not leave leave until they do. Since August, 853 cases of Ebola have been confirmed and 578 people are known to have died, according to the Congo's ministry of health. In it's seventh month, the outbreak is now the second deadliest in history. The attacks on treatment centers greatly hinder the ability to contain the virus, as people flee the scene out of fear. Congo's health ministry warned that a "significant upsurge" in new cases could follow, the AP reports. There are dozens of armed groups active in this region of Congo, though health workers have been allowed work in the area after careful negotiations, according to the AP. Mistrust is common in this isolated part of Congo, where a history of armed conflict has made some people wary of outsiders. In addition, this is the region's first outbreak of Ebola and for those unfamiliar with the virus, at first it doesn't seem too different from familiar diseases like malaria or typhoid fever. Ebola is spread from bodily fluids of those infected, including the deceased. NPR's Nurith Aizenman reports there is skepticism from locals over the need to get treatment from foreign medical workers in plastic suits. The president of Doctors Without Borders Joanne Liu said the Ebola outbreak can not be beaten unless the community trusted the authorities and Ebola responders and were treated humanely, NPR's Ofeibea Quist-Arcton reports. But despite the availability of new vaccines and treatment options, people are reluctant to come forward.